Just a quick hello, and a reminder that if you haven't gotten your name in for the Inspired Lighting Sewing Machine Light Kit give away, you need to do so TODAY!!! Five lucky names will be drawn tomorrow, September 1, 2016, so although many have entered, chances are great that you might win a kit of your very own. What you will receive is pictured below, the LED light strip, an on/off switch, and wiring with clips to hold it to your machine. The light strip is actually long enough for 2 machines, so if you do win one of the kits, you can order just the switch and wiring and light up another machine. Below is a before and after picture. I was so surprised by how much extra light this little LED strip actually put out. 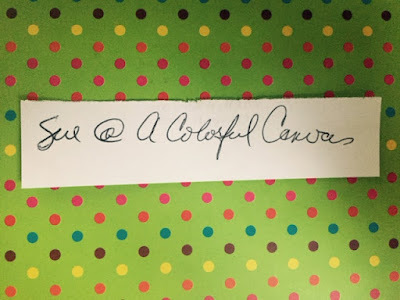 So, if you haven't entered the drawing, pop over to THIS POST and get your name in. You have until midnight tonight. And remember, the drawing is open to the United States AND Canada! So many of you really enjoy when I do a post on details. 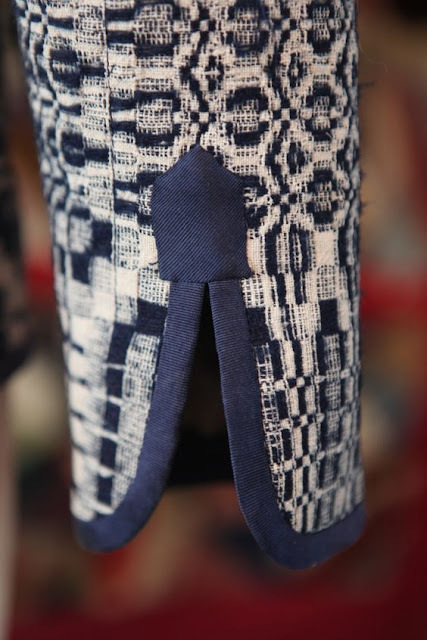 Details are what give our garments that special little punch and make people stand in amazement when they find out that we made out garments. So this morning, a few ideas that sparked my interest and that I thought you might enjoy as well. I thought this was interesting. 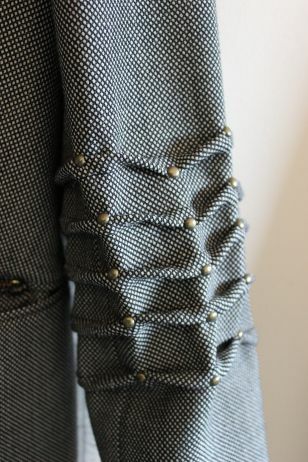 The sleeve was extended to allow for the pleats and then given a special touch with the studs. This could be done with beads as well. 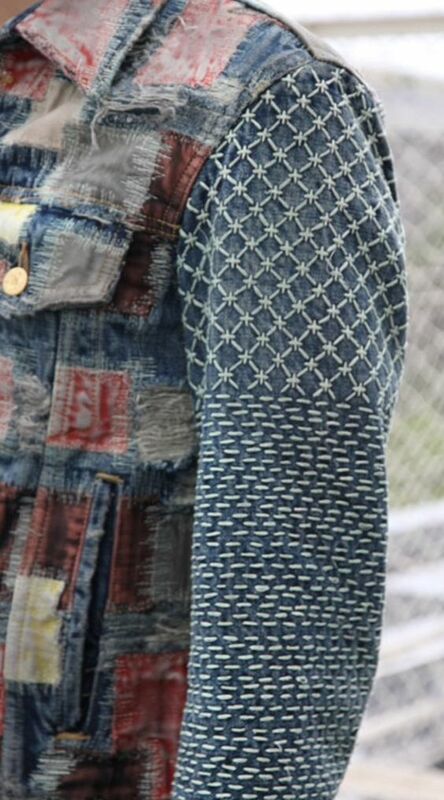 Love the combination of the Boro jacket and the Sashiko stitching. 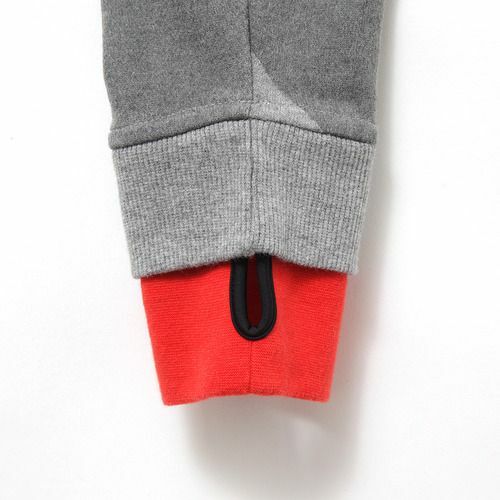 Now this is one of those tiny little details that just floats by the eye, but gives a garment a special spark. Love the added touch of the tab on the edging of the sleeve. This is from Rolling In Cloth and you can check out the entire post HERE. Men's clothing can offer a well of inspiration. Love the special detail of the buttoned cuff. How about this cuff? So subtle and yet, huge impact. 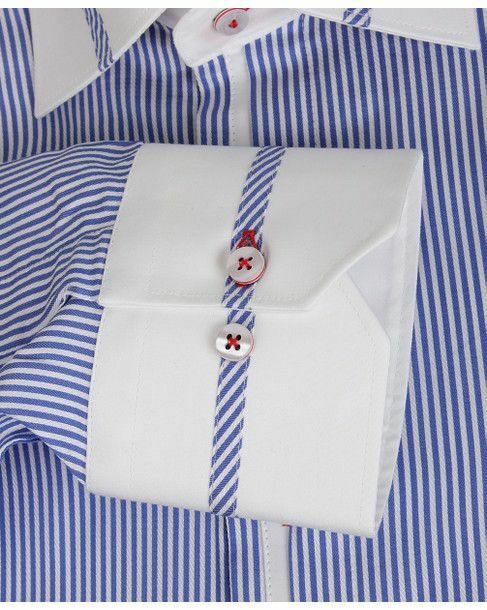 The bias strip on the white cuff and the red stitched buttonholes and buttons. Here's another great cuff. 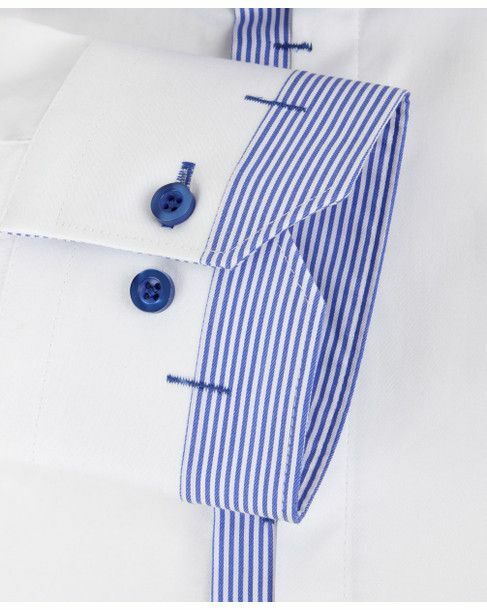 This time they used blue buttons with blue stitched buttonholes, and edged the cuff in the stripe. Check this out! 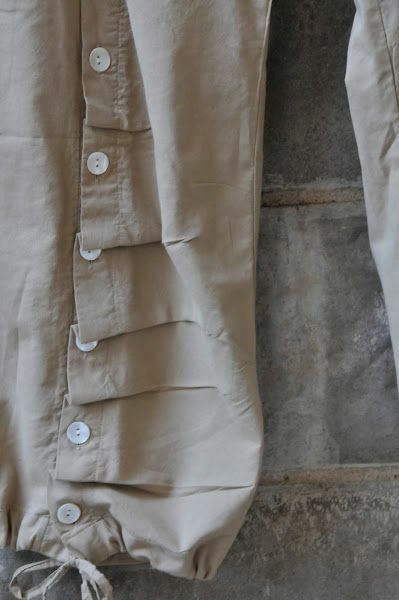 A pocket in a placket. Another sweet idea. 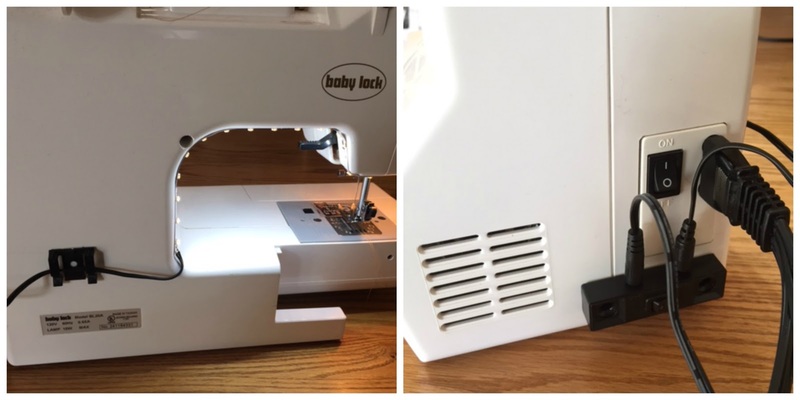 If you give it a try, just make sure your stitching is super secure! 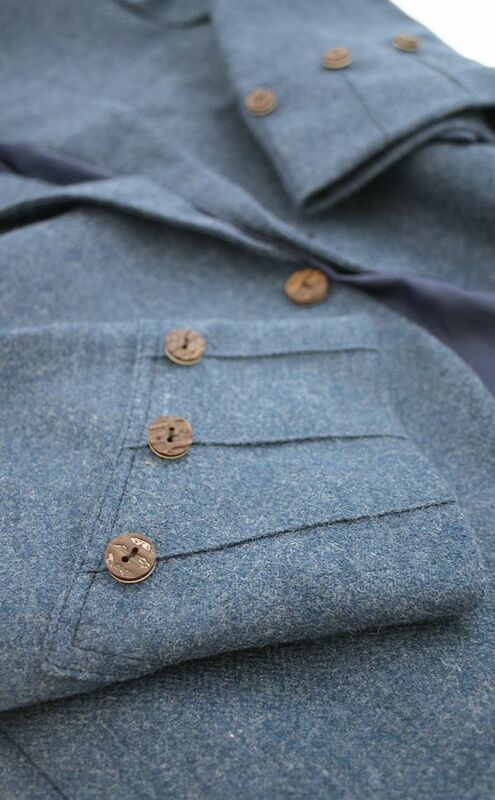 Love the simple button loops on this front placket and how the welt pocket has been accented. Another subtle, but interesting detail on a cuff. This is on a wool coat that was manufactured in Scotland. 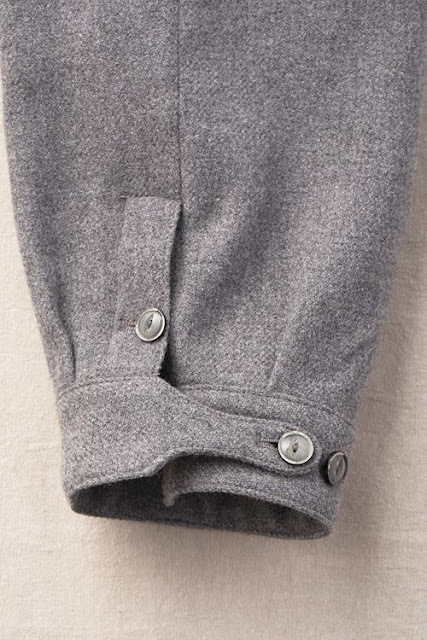 This button detail is on a pair of pants, but this would also look great on a sleeve. 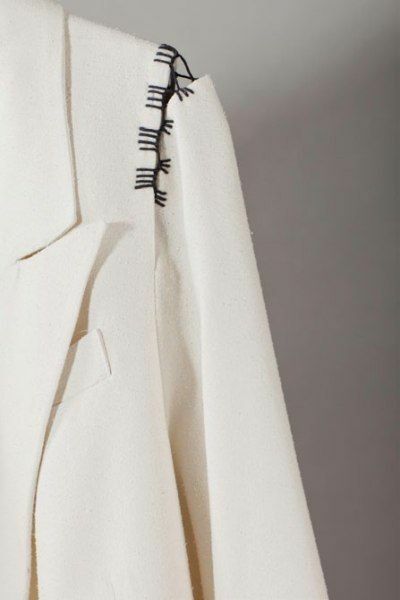 Love how the sleeve was accented with the hand stitched detail. All you need is a crochet hook! Vintage garments can provide another well of inspiration. 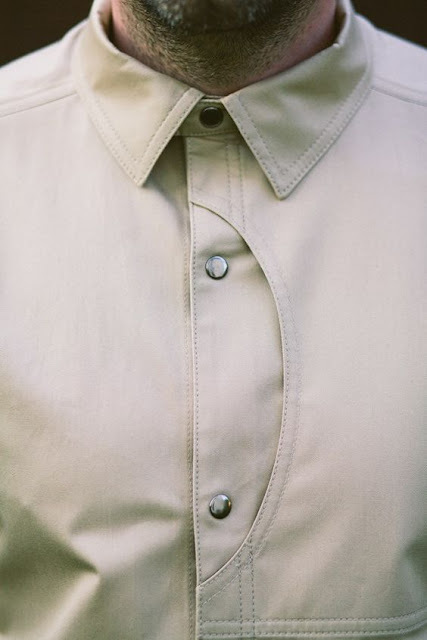 The collar was extended as well as the front button placket and then folded back. 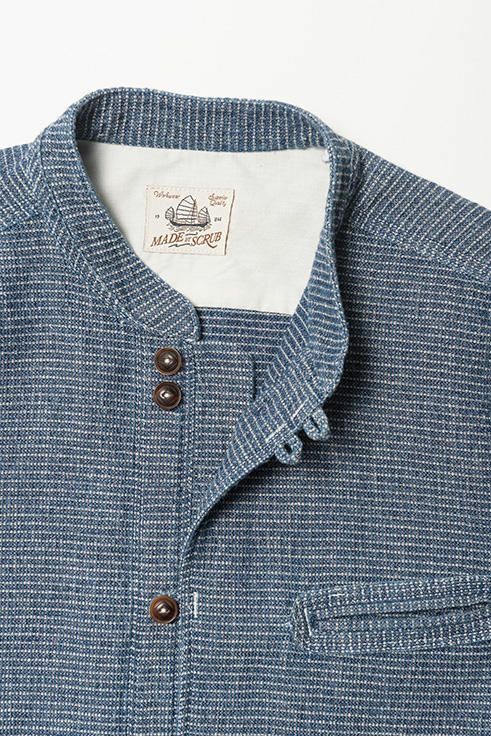 And finally, have you ever had a t-shirt or sweatshirt that you loved but the sleeves shrunk in the wash? Add a thumb cuff and what not make it stand out?!! 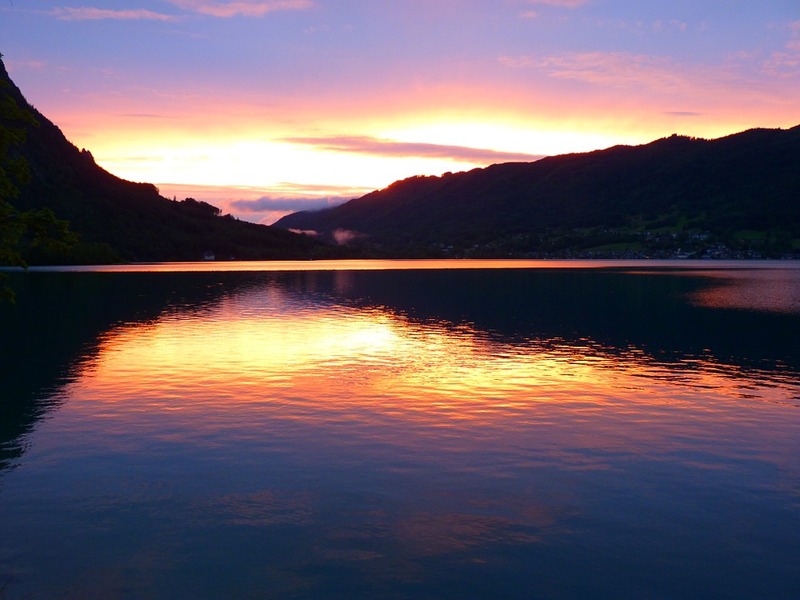 Hope you have a wonderful week! I know I will, I'll be doing a lot of sewing this week. My niece's wedding gown is tops on the list, and then a few other projects that I'll share soon :) So, a happy week in the studio. Hope you get a little creativity worked into your week too! 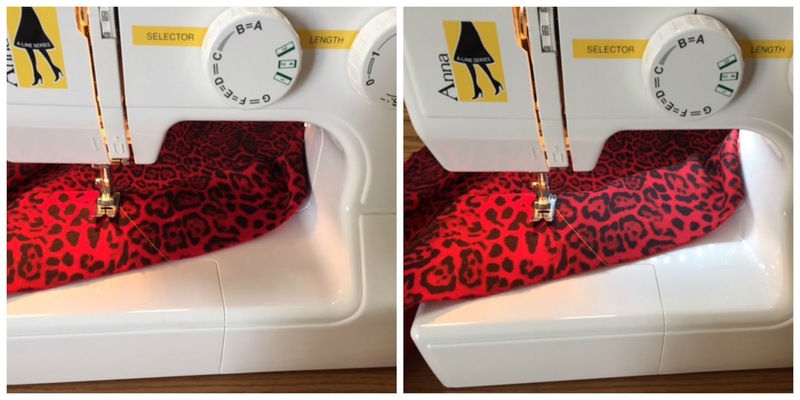 Next week I will be doing a little video post on attaching the Inspired Lighting sewing machine light kit to my machine. Just in case you missed it, Inspired Lighting has given me the awesome opportunity to give away 5!! !, yes, 5 light kits, so be sure to pop over to THIS post and get your comment in for a chance to win. The drawing will be September 1, 2016. Can you believe that September is right around the corner? Now for the Swoon Patterns Stella Weekender Bag. I added a couple of pictures to the collage below that show how the front pockets actually sit away from the bag. Fabulous feature. If you do decide to make the bag, don't worry, the pockets are easier to make than you might think. The handle is featured in the bottom right picture. I know that the small curves may seem intimidating, but again, easier than you may think. All in all, a super fun bag to make! Please email me at sewbussted@yahoo.com so I can get your pattern off to you. Thanks so much to all of you for stopping by. The sew along will begin the first week of September and I think that you are truly going to enjoy putting this project together. 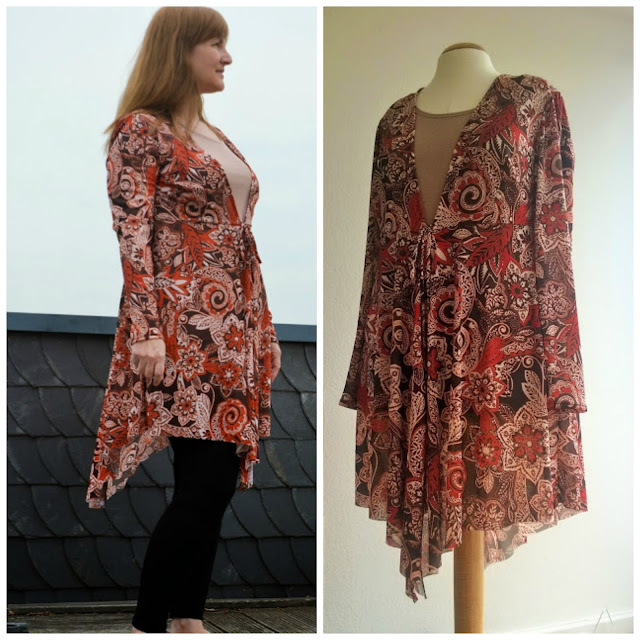 If you have not purchased a pattern, You can find it HERE on the Swoon Patterns website, or HERE on the Shop Sew It All website. Happy Wednesday All!!! Yep, it's me :), an actual post! I was recently doing a little cleaning up of my blogroll. It always breaks my heart when I see that someone has decided to no longer blog. After a year of no blogging, I figure that that they have given up and I remove the address from the blogroll. Sometimes though, I am quite happy to see that they have not given up blogging, but have just changed their blog address. So many of you are moving over to Word Press. Just in case you have missed out on a few new addresses, I thought I would give you a quick update. Farhanna of Sew Fashionably Modest is no longer blogging at http://farhanasews.blogspot.com/. You can now find her at her sleek and pretty blog, Secret Garden Studio. Farhanna loves to sew, but her passion is design and drafting, so be sure to pop over and check out her blog. Another change is Virginia, of Virginia's Sew Blessed Daughter. 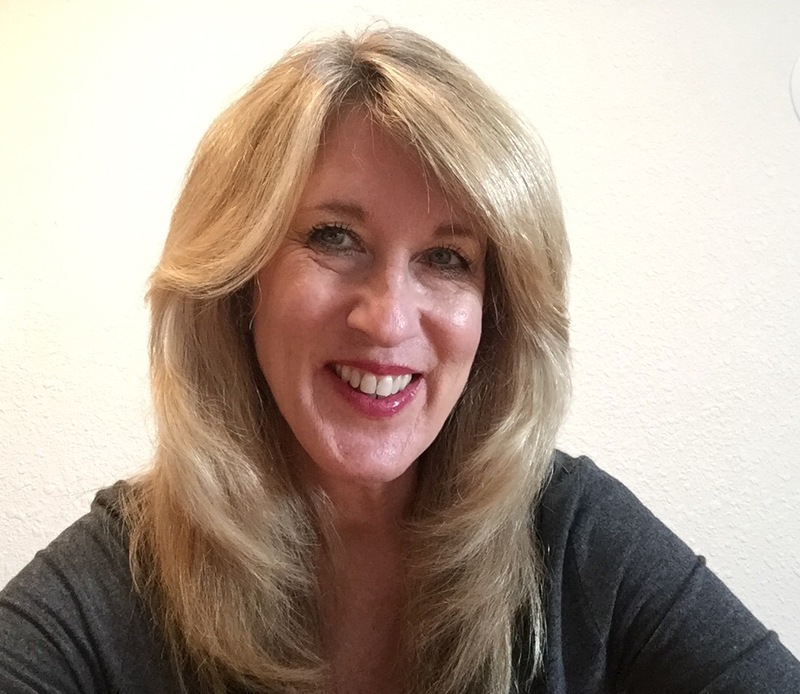 She too has moved over to a Word Press site and you can find her blog HERE. Marcy Tilton has also moved. You can now find her fabulous website at MarcyTilton.com. 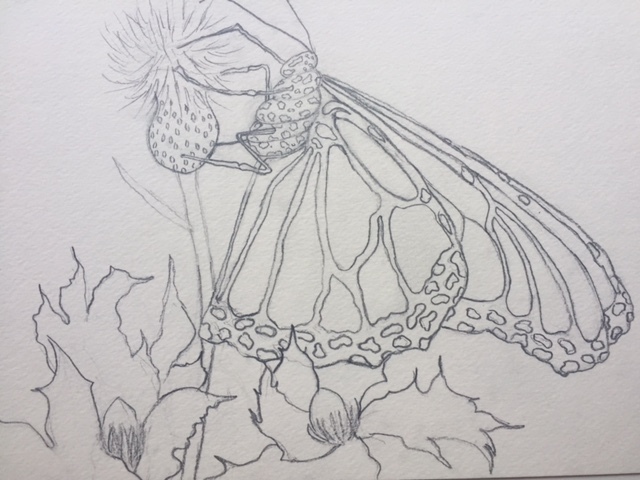 Be sure to pop over if you haven't already. Marcy Tilton has a contest running where you can win $1000.00 in fabric!!!! And...just for entering the contest, you will be given a 10% discount on any fabric purchase. I have a very hectic weekend coming up, but after that, my schedule will slow down, a bit anyway. I'm looking forward to connecting with all of you a little more. And doing the right thing anyway. It's Sunday, and I do have a great recipe to share, my homemade tomato sauce. It's delicious by the way :), but since my blogging has been a little lacking, and I don't want everyone to think that this has turned into a cooking blog, I thought that I would share a sewing item today, and save the sauce for later. 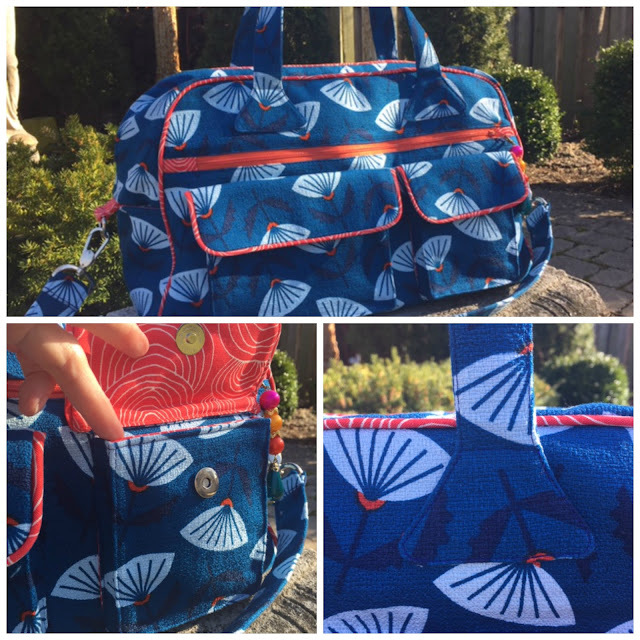 My Swoon Patterns Stella Weekender Bag sew along will be starting the first week of September on the Sew News blog, so it's time for a give away!!! This is such a great bag with lots and lots of pockets. The front of the bag features 2 pockets with flaps and a big zippered pocket. The back has 2 pockets, each big enough to hold an I-Pad. There are pockets on either end of the bag. And, as if there weren't enough pockets on the exterior of the bag, there are more pockets on the interior. The only issue you may have is which pocket holds what! If you think you might like to win a pattern, just leave a message here on this post. I'll announce the winner on Friday, August 26, 2016. Last February I was given the opportunity to host a giveaway for the Inspired Lighting Sewing Machine Light Kit. Inspired Lighting sent me a light kit and said that if I liked it great, and if not, well, that was okay too. As it turned out, I LOVED the light kit and was surprised by how much light the light strip put out. The kit comes with an LED light strip that has an adhesive backing, and all the tools you need to attach the strip to your machine. Simply place the light strip along the inside of the machine and then wrap the cord around to the side. All of the pieces have an adhesive backing, so installation is super easy. The kit even comes with its own on/off switch. Before I installed the light strip, I plugged it in just to see how bright the strip would be and I was very surprised by how much light the narrow strip gives off. Here's a before and after picture. The picture on the left is before and the right, after. A BIG difference. Inspired Lighting is giving away 5, yes 5! light kits to 5 lucky winners!!! The last give away was only open to those of you living here in the United States, but this time around, Inspired Lighting has opened the give away to all who live in the U.S. and Canada!!! 1.You must be a follower of this blog. 2. Leave a message on this post and let me know how you follow, i.e. email, Bloglovin, Feedly, etc. 3. You must live in the United States or Canada. The winners will be announced on September 1, 2016. A big Thank You to Inspired Lighting for giving me this opportunity to once again share a great product. as to why you continued to do things you hated day in and day out. Don't worry, this isn't turning into a food or cooking blog. This last week I was asked to put a couple of my art pieces in an exhibit. As much as I would like to participate, my answer was, "I'm sorry, but if I add one more thing to my plate, I think I will lose my mind." It has been a difficult summer, with one thing after another going wrong. And on top of it all, we have had house guests, which I truly enjoy, but, I'm tired. With two guests in the house this past week, I decided to just take a break and not visit the blog. Although I may take a break, I still eat, and I still cook, and I still enjoy sharing some of my wonderful finds with you! Last week I told you how I just couldn't throw away the lovely greens from the carrots that I purchased at the farmer's market. 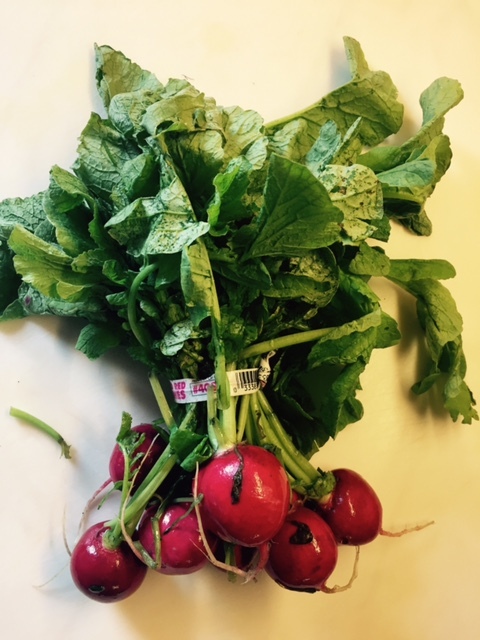 Well, this week it was the greens from the radishes that I purchased. I thought that if the greens from the carrots could make such a lovely pesto, what could I do with the radish greens? 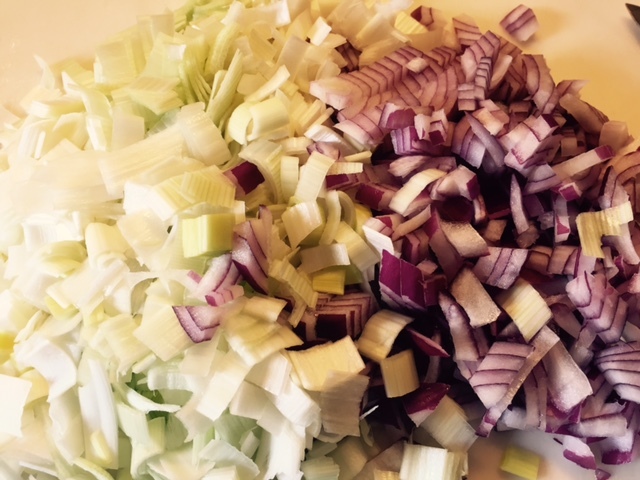 To make the soup, you begin with leeks and a purple onion that you chop and then saute in butter. For a vegan version, just use olive oil. The recipe says that you may either skin the potatoes, or leave the skin on. I left the skin on the potatoes just to add to the nutrients in the soup. Once the leeks and onions have softened, the potatoes are added along with water. The recipe also calls for the addition of an anchovy. Again, for a vegan version, just leave it out. I love anchovies, so I added it and all it does is enhance the soup. The mixture is then boiled until the potatoes are tender. At that point, add the radish greens along with some chopped parsley and allow to cook for another 5 minutes. Puree the mixture and then add 3/4 cup of chopped radishes. 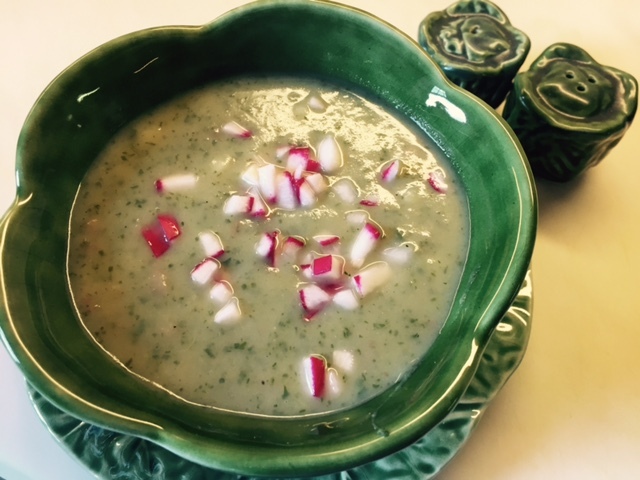 Allow the radishes to sit in the hot soup for a few minutes before serving. They will become tender and will also mellow a bit. The final addition to the soup is cream. I saw no need for the cream and deleted it from my soup. So as you can see, the soup is very adaptable to a vegan version. In case you missed it, you can find the original recipe HERE. 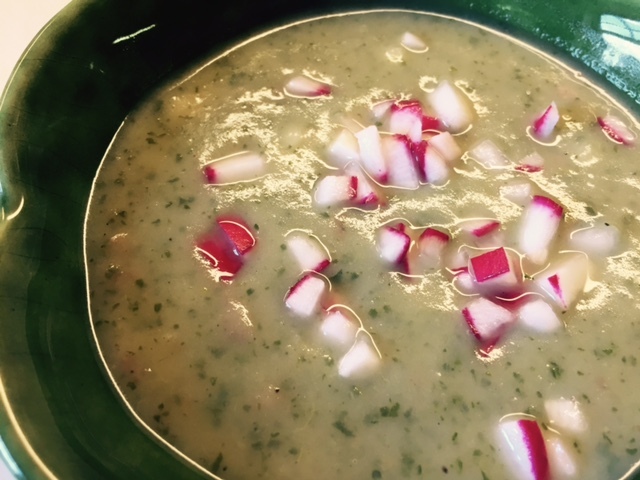 I think that if you decide to give the recipe a try, you'll truly enjoy the mellow, yet robust taste of the soup. This soup is perfect for a cold winter evening, but I'm one of those crazy people who eats soup all year long, even on the hottest days! When the farmers begin bringing the fresh produce into our local farmer's markets, I am in heaven. 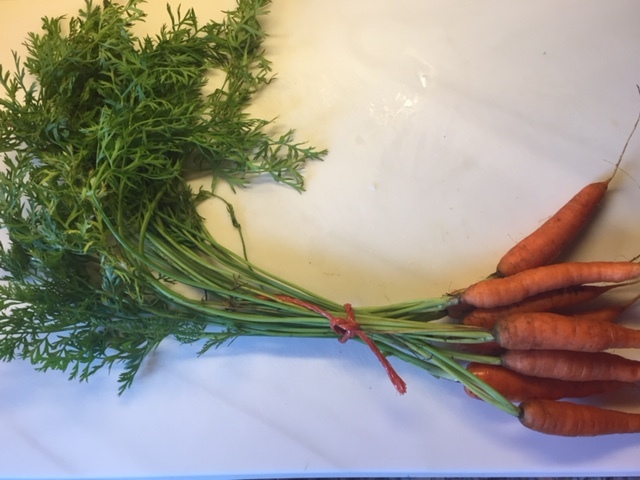 A few weeks ago, I stopped by a market and fell in love with a bunch of fresh carrots, well, if one can actually fall in love with carrots ;) They were so fresh and not only did the carrots look great, but the tops were so pretty and I just couldn't chop them off and toss them. I have heard of carrot top soup, but that didn't really strike my fancy, so I began to look around and I round a recipe for carrot top pesto. Score!!! When purchasing fresh carrots with the stems in tact, just be sure that the greens are truly fresh and bright green. All you need to do is snip the greens from the stems, give them a bit of a chop, throw the greens along with some garlic, roasted walnuts, olive oil, salt and black pepper in your food processor and you have a truly delightful pesto. The soup is Velvety Carrot Soup with Carrot Top Pesto and you can find the recipe HERE. The soup is so very simple to make, basically just onions and carrots. This is the second batch I've made. 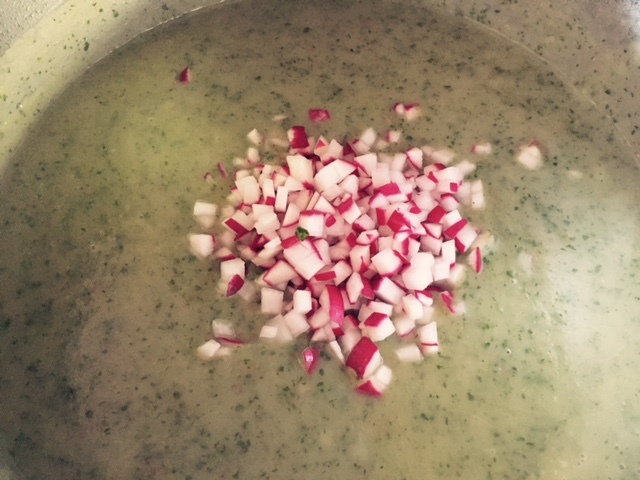 With the first, I followed the recipe exactly, this time around I added a clove of garlic to the soup. A nice addition. 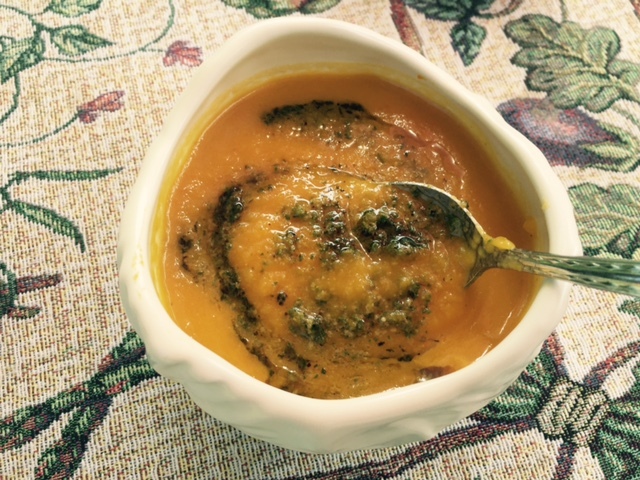 Serve the soup with a dollop of the fresh carrot top pesto. Be sure to stir it around so you get a bit of the pesto with every spoon full! As I said, this is my second batch and it will not be my last. The soup will freeze well, so I plan to keep some in small containers for a quick lunch. If you like carrots, I think you'll truly love this soup. Earlier this week, I shared with you that my husband and I hosted a student this past week. One of her priorities was to learn how to sew. Now all of us who have been sewing for quite some time, or even, not so long, we all know that truly learning to sew isn't mastered in a day. 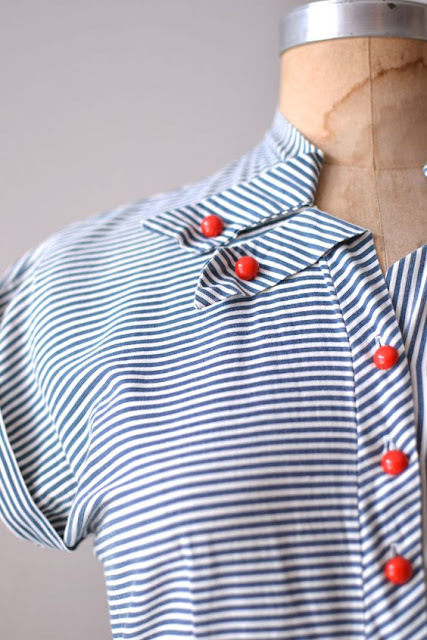 My objective was for her to walk away with a couple of projects that she would feel good about, and the confidence that sewing is something she can do. Well, as it turns out, she is a girl after my own heart. I am devoted to wearing a sleep mask at night. It's amazing how the total darkness allows me to calm down and sleep soundly. As it turns out, she too enjoys wearing a sleep mask. A few months ago, I noticed a free pattern for a sleep mask from Fabrics-Store.com. It's pictured below. I ended up making 3, basically used up a scrap that I had, but I also used a little of some linen that I ordered from Fabrics-Store.com. I always like to have at least 1 spare for when the other needs to be washed. I felt that the sleep mask would be a great first project. She enjoyed making the mask so much that she decided to make another as a gift for a friend. When we went through my fabric scraps, she found the airplane fabric and was set on what she wanted to do. As it turns out, she too loves airplanes :) She got a kick out of positioning the airplane and helicopter over the eyes. We had a little fun with the project and used a contrasting fabric for the band. Sadly, I didn't get a picture of the reverse side, but we lined the back of the sleep mask with a plaid flannel which will make the mask nice and soft against the face, especially for sleeping. 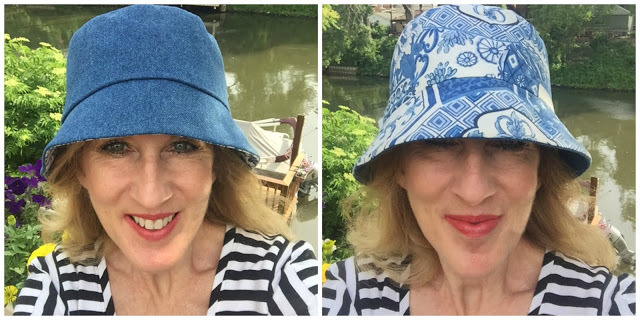 You may remember the bucket hats I made a few weeks ago. You can find the tutorial HERE as well as a link to the free pattern. She loved my hats and wanted to make 1 for herself...out of the same airplane fabric :) So cute! Like mine, the hat is reversible and we used denim on the opposite side. This made a great second project. With the sleep mask, she learned how to sew around a curve. Attaching the crown to the side of the hat was a little challenging, but with the experience of the sleep mask, she quickly got the hang of it. 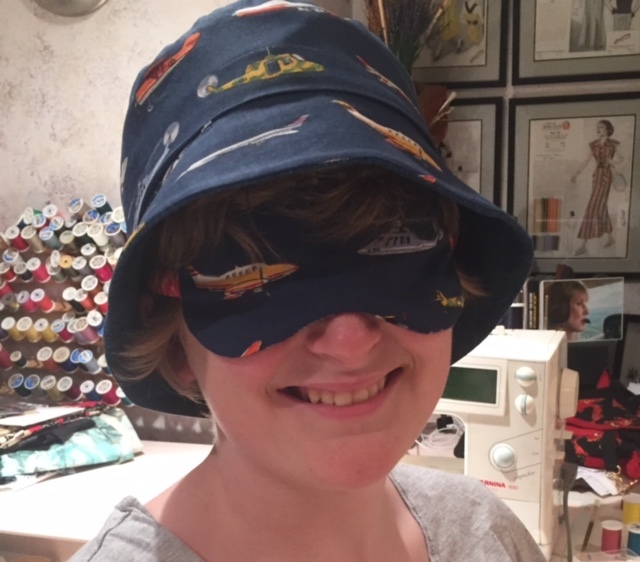 And finally, who doesn't need a sleep mask that will match their bucket hat?!!! It's been quite some time since I've worked with an absolute beginner, but I had a blast. I really enjoyed her excitement over her accomplishments. In case you missed the link to the free sleep mask pattern, you can find it HERE. Check out this guy, so beautiful. This is the actual setting. Could anything be more beautiful?!!! 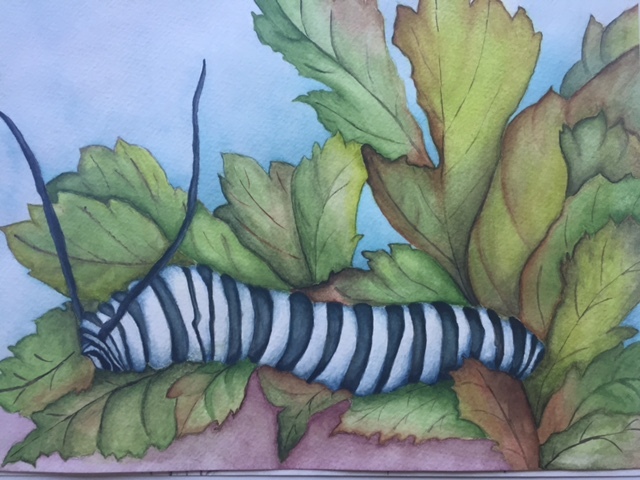 When I saw where the butterfly had landed, I immediately knew that I had to paint this. This piece is part of a series of paintings, or will be I should say. Today is not supposed to be about me, so let's take a look at a few lovely bloggers whom you may not know. First up is Lori of Monkeyroom. She's an American living in Germany. As you'll see, she has so many interests, and does them all so well. 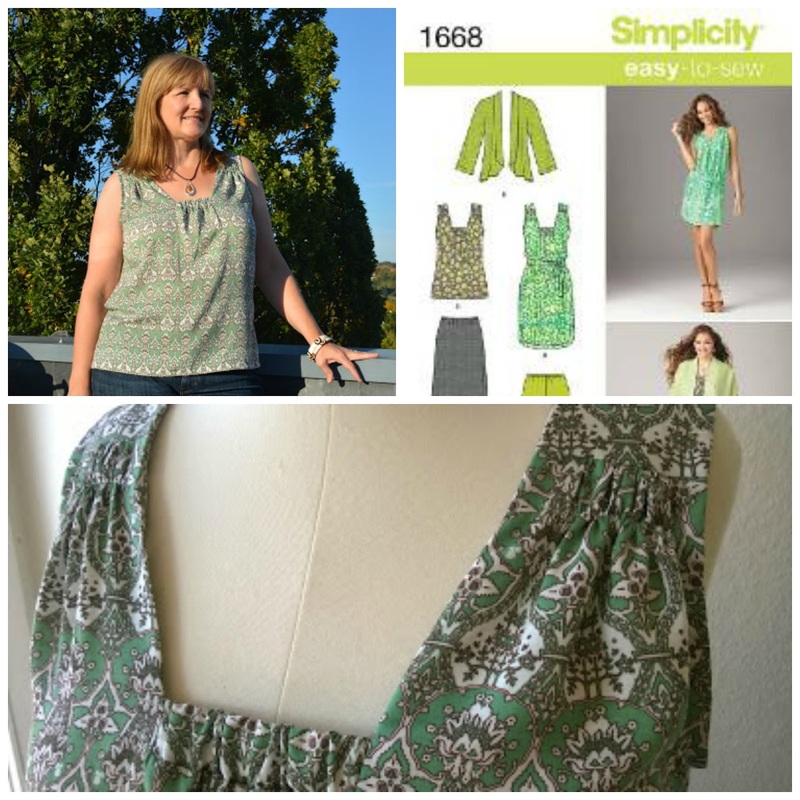 Lori loves to sew and makes lots of great tops. 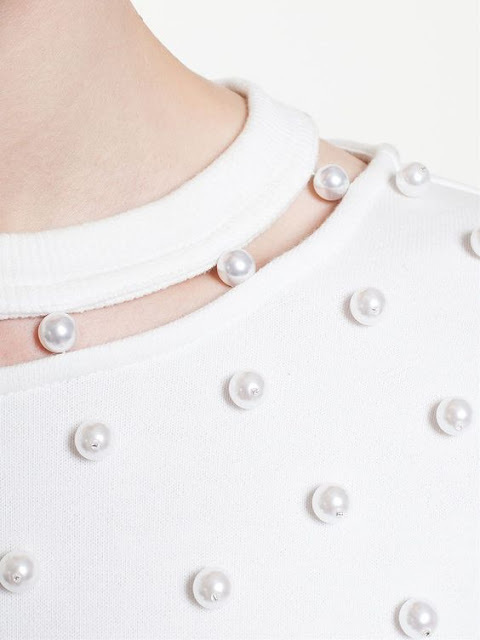 I especially liked this Simplicity top. The neckline is so pretty. Lori wasn't so sure about this jacket, but I think it's fabulous. She loves to knit. 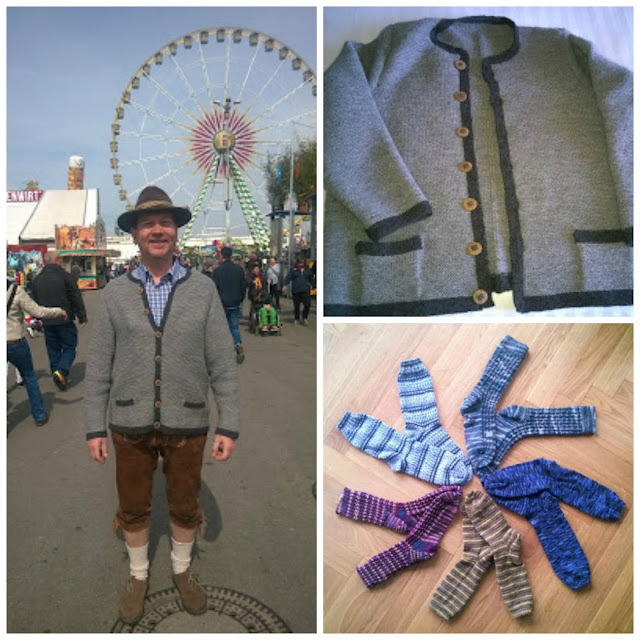 Check out the great sweater she made for her husband, and all those socks!!! And last, but not at all least, she loves to weave. 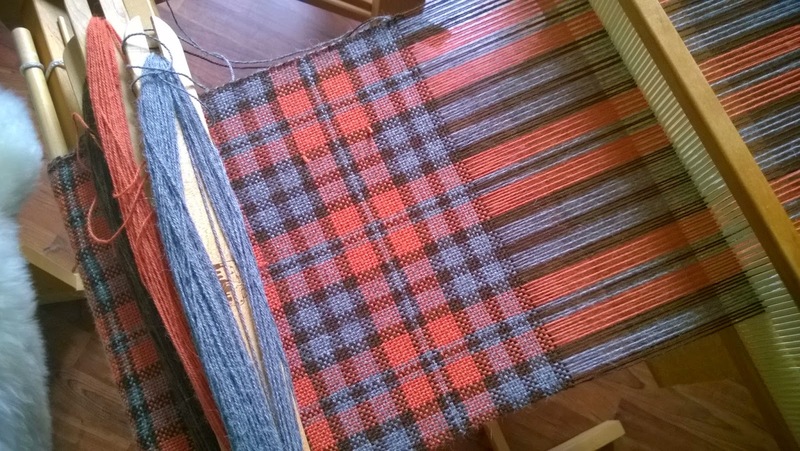 Check out her blog and you can see the finished scarf. Such a nice piece. BTW, you can find Lori on Pattern Review HERE. Next up is a lady who is brand new to my blog, but I have a feeling that most of you know her, and if you don't, then it's about time!!! 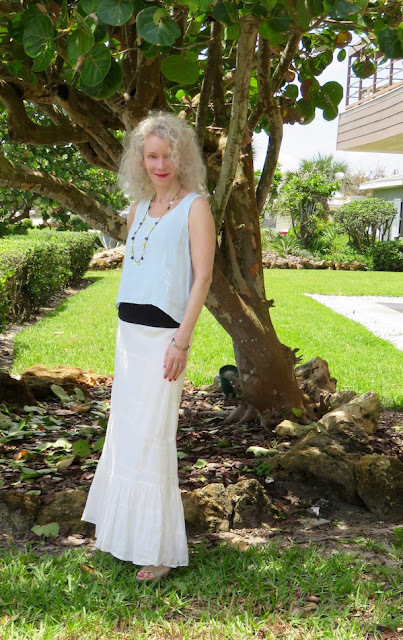 Meet Patti of Not Dead Yet Style. She's not a sewist, and she doesn't cook, but she loves who she is, where she is in life, and is celebrating every moment of her life with style. And even better, she invites all of us to join along with her post, Visible Mondays. Each and every Monday, Patti invites all of us to link up to her post and celebrate our style, whether you made your garment or not. So ladies, for those of us who sew, this is a great opportunity to shout to the world that not only do we have style, but we're making that style with our own two hands!